To see the links move the mouse on the highlighted days! Assiano is another one of the many villages around Milan, originally small completely independent agricultural comunities, later turned into simple localities after being incorporated by the City of Milan following its expansion. The origins of Assiano are very old, since finds from the Roman era seem to already refer to it. Assiano remained an autonomous municipality until 1841. In 1841 the municipality of Assiano was aggregated to that of Muggiano, in turn annexed to Baggio in 1869.Finally, in 1923, also the town of Baggio was suppressed and annexed to the city of Milan. The village of Assiano, consisting essentially of the homonymous farmhouse and the land attached to it, passed to the Feltrinelli family in 1946 and is now owned by ALER. It is the only Milanese village not to have suffered the slightest sign of building expansion on its territory, remaining nothing more than a country house complex completely surrounded by cultivated fields. It should be emphasized that Assiano is on the line of the castles that are located along the ducal road that leads to Cusago, Abbiategrasso and Vigevano. This road was at the time of the Sforza and the Visconti of extreme importance, so that it was even not freely accessible to ordinary citizens. One of the most valuable elements of the village is the small church, in fact no larger than a chapel, dedicated to Sact Martin (Fig. 2-5 and large picture) and also equipped with a small bell gable, curiously not above it, but above an adjacent building. 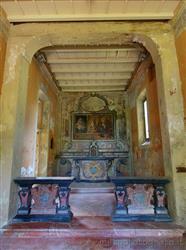 Despite its miniscule size it houses a valuable baroque altar in polychrome marble. In front of the altar there is also a balustrade in rare black marble. In the small church was present, still in 1904, a precious triptych by an unknown artist which served as an altarpiece. The work was however already stolen in 1910, when it appeared to be replaced by "indecent oleographs". The original triptych could never be found again. The church is located inside the manor house (Fig. 7), which is embellished with art nouveau elements. Although the chapel's conditions are not good, it has nevertheless benefited from a significant recent restoration work, consisting in the rebuilding of the roof. Another peculiar element is the fact that the manor house was built on the head of a fount, one of the many that are present in the area. This is because the constant temperature of the water at 10 degrees allowed to have available a refrigeration room where to store sausages, butter and cheese when the technology that we use today did not yet exist. It must be said that, paradoxically, from the photographer's point of view, the degradation that afflicts the buildings offers the possibility of identifying unique views, with combinations of colors and shapes of great suggestion. The small village enjoys the attention of the community of farmers in the area, who have proposed various projects aimed at its recovery and its enhancement. Unfortunately, the institutions, as often happens, are very uncooperative. If you are interested in a guided tour of this monument send an email! Search Assiano in the section Photography!